Cleve Hill House, at Downend in the parish of Mangotsfield, approximately 7 km north-east of the centre of Bristol, was demolished in 1930 and its grounds redeveloped for housing. A surprising number of garden features and estate buildings have however survived to the present day. One of these structures, a lodge with an unusual quatrefoil plan at 86 Downend Road, was discussed by Stewart Harding in an article in the Avon Gardens Trust Newsletter No 5 (Summer 1989) entitled “The Wizard’s Lodge Rediscovered”. 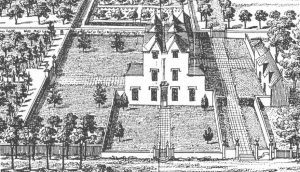 Harding ascribed the design of the lodge to the eccentric polymath Thomas Wright, the so-called “Wizard of Durham” (1711-86), who is known to have worked at Cleve Hill in the 1750’s. In October 2000 another garden building at Cleve Hill was recorded by Laurie Bingle and the present writer. This has prompted the more general re-examination of the landscape history of the estate which follows. 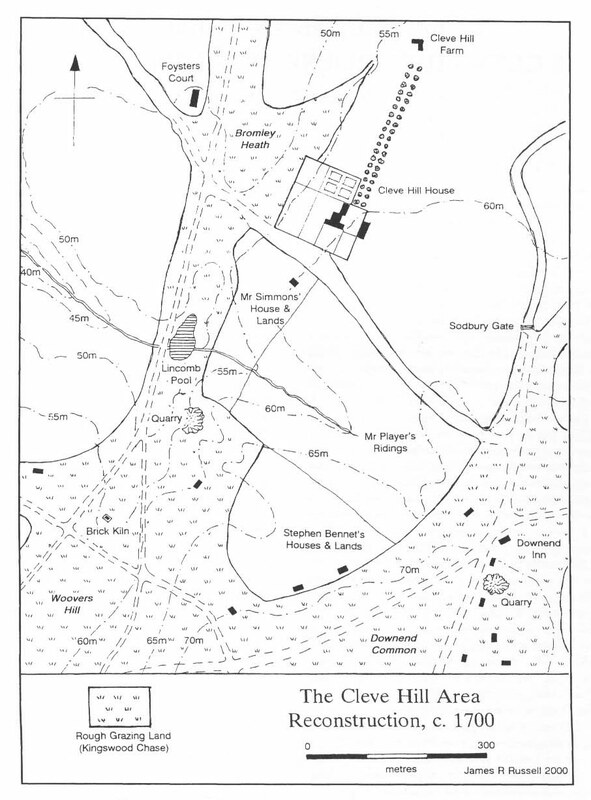 Readers should note that the locations of buildings and features mentioned in the text are indicated by 8-figure National Grid references with the prefix ST.
Cleve Hill House (ST 6488 7717) was situated near the crest of a low escarpment running SW-NE, the cliff or bank which gives the place its name (Smith 1961, 99). To the west the ground drops away towards the Frome Valley, providing fine views across to Stoke Park and the Purdown ridge. The property seems to have been purchased and the house constructed around 1627 by William Player, a prominent lower landowner who was instrumental in the early development of the Kingswood coal industry (Jones 1899, 118). It was certainly in existence by 1653, when a survey refers to “Mr Player’s mansion house & grounds called Cleave Hill” (Ellacombe 1881, 191). 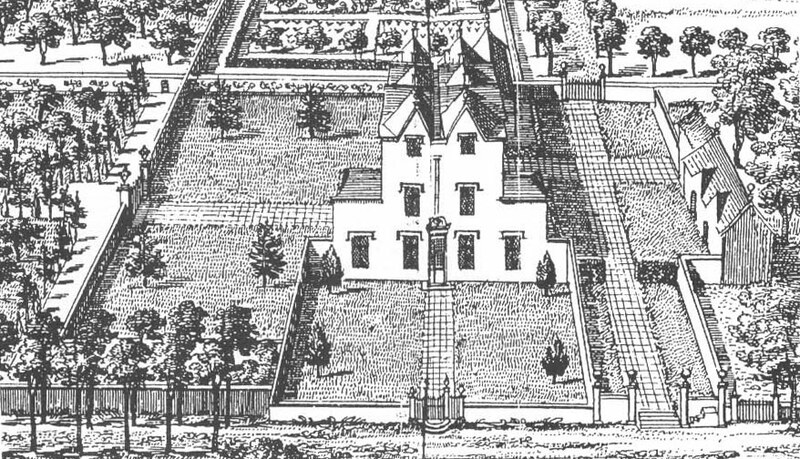 In Figure 1 an attempt has been made to reconstruct the environs of the house as they would have appeared around 1700. This is based largely on a contemporary sketch plan of “Mr Player’s Manors …. in the Parishes of Mangotsfield & Bitton” which purports to date from 1750 but appears from internal evidence (such as the names of the landowners mentioned) to have been compiled some 30 or 40 years earlier (Ellacombe 1881, plate 11). The Cleve Hill estate lay on the convoluted northern boundary of Kingswood Chase, a former Royal hunting ground which by 1700 had been carved up for mineral exploitation by the Players and other local magnates. The gardens of the house were adjoined to the west by Bromley Heath, a corridor of common grazing land running southwards into the Chase itself, a vast open heath punctuated by quarries, coal-pits and scattered miners hovels. To the south-east a cluster of cottages surrounding the Downend Inn (now the Horseshoe) formed the nucleus of the present village centre of Downend. Our knowledge of the original Cleve Hill House comes almost entirely from an engraving of c1710 by Johannes Kip (Atkyns 1712, plate facing 546; Fig.2). This shows a relatively modest and compact rectangular mansion, two storeys high below a multi-gabled attic. The main entrance front, only two bays wide with a central baroque doorway and small single-storey wings to east and west, faced southwards across a courtyard towards the present Cleeve Hill. 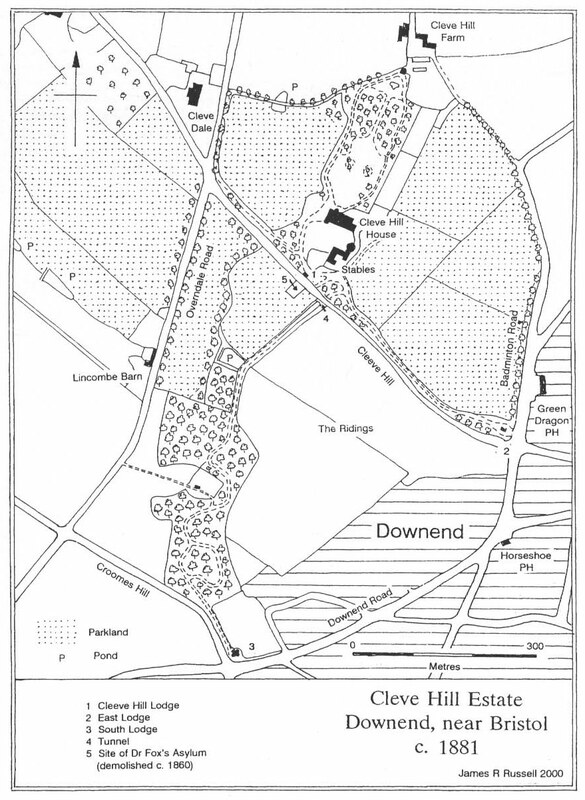 Kip shows a grid of rectangular walled gardens to the west and north of the house, a service courtyard to the east and an avenue of trees running northwards towards Cleve Hill Farm (ST 6503 7743) a still-extant gabled structure omitted from Kip’s illustration but almost certainly in existence by 1710. In the absence of corroborative pictorial evidence the accuracy of Kip’s engraving is hard to estimate; while his depiction of the house is probably fairly reliable he appears to have considerably exaggerated the scale of the gardens, while his treatment of the surrounding roads and countryside is as usual demonstrably arbitrary and schematic. Thomas Player, the last of his family to occupy Cleve Hill, died in November 1739, leaving the property to his nephew Charles Bragge. Bragge is a curiously elusive figure about whom few solid facts are readily ascertainable. Recent research by Nicholas Deas has however established that he was born around 1715, the some of William Brag(g)e and Elizabeth Player of Hatfield Peveril in Essex, and entered St John’s College, Oxford in July 1733, at the age of 17 (Foster 1888, 151). He was thus about 24 years old at the time of Thomas Player’s death; there may have been a brief delay before he gained full control of his inheritance since under the terms of his uncle’s will the estate was to be held in trust for him by his aunt, Lucy Player, until he reached the age of 25 (Jones 1899, 120). 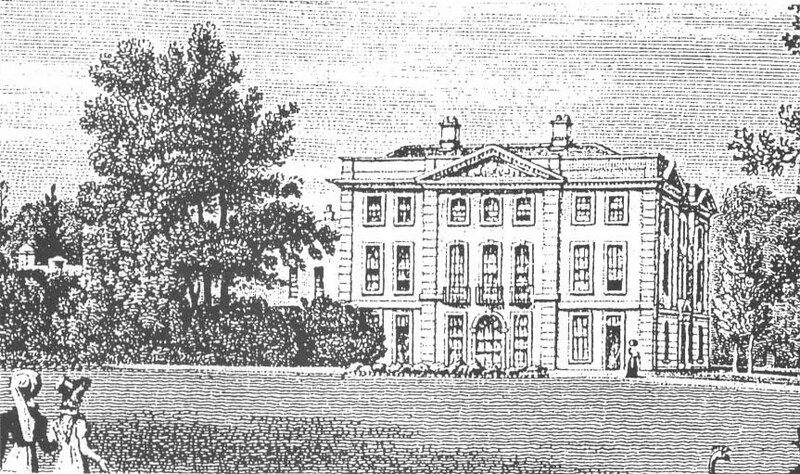 At some point during this period of transition Cleve Hill House was extended and re-cased with new “show” fronts in the classical style to the north and west; both facades can be seen prior to Victorian modification in Storer’s engraving of 1825 (Brewer 1825, plate facing 168; Fig.3). The new north front was three storeys high and seven bays wide with a three-bay centre topped by an elaborately sculptured pediment. The west front, which henceforward formed the main entrance to the house, was five bays wide with a slightly recessed three-bay centre. The projecting end bays had pediments supported by paired Corinthian pilasters, while the central entrance was framed by a plain pedimented doorcase. The old entrance front to the south was also re-faced and re-fenestrated, but in a much plainer manner (Kingsley 1992, Figure 58). Little information is available concerning the internal planning or decoration of the house after remodelling; it appears however that much of the 17th-century structure, with walls up to 9 ft (3m) thick, was retained (Jones 1899, 116). It remains unclear whether all this work was instigated prior to 1739 by Thomas Player or during the 1740’s by the young Charles Bragge. The architect responsible has also yet to be identified. The north front in particular displays marked similarities with the facades of Bristol town-houses at 12 St James Barton (now demolished) and 68-70 Prince Street, all dateable to the period 1726-28 and attributed to John Strahan (Ison 1952, 161-4, Mowl 1991, 17-18). The work at Cleve Hill has indeed been assigned to Strahan by Dr Mowl, who has suggested (almost certainly mistakenly) that it pre-dates the Bristol houses (Mowl 1991, 14). A likelier candidate than Strahan (who died around 1740) is however the Mangotsfield mason John Greenway, who is known to have carried out minor alterations at Cleve Hill in 1723 (Kingsley 1992, 106; Gloucester Record Office D421 E66). It should be noted that there is little to support Nicholas Kingsley’s assertion that the remodelled west front was “palpably” much later in date than that to the north (Kingsley 1992, 106-7); both west and north facades incorporated very similar segmental-headed windows of a type characteristic of Bristol buildings of the first half of the 18th century. fig.3 View of Cleve Hill House after early 18th-century remodelling, looking south, by J Storer, 1825 (Brewer 1825, plate facing 168). While a miasma of uncertainty still envelops the remodelling of Cleve Hill House the authorship and date of the gardens laid out to the north of the new mansion are less open to question. These were almost certainly created in the early 1750’s, probably around the time of Charles Bragge’s marriage to Anne Bathurst, which took place on 25 January 1752 (Jones 1899, 123). Bragge was on friendly terms with his near neighbour Norborne Berkeley of Stoke Park, and through him would have made the acquaintance of Berkeley’s architect and gardening guru Thomas Wright, to whose books of designs for Arbours & Grottoes he subscribed in 1755. The Wizard of Durham s connection with Cleve Hill was first noted by Eileen Harris in her 1979 edition of Arbours & Grottoes. Wright’s “Lennox-Boyd” album in the Victoria & Albert Museum includes a plan for “Mr Brag s garden at Cleve Hill, near Stoke”; this is accompanied in the album by drawings relating to the early was proposed for the south-eastern corner of the garden, close to the house, commanding a view across the circular lawn towards Stoke Park. fig.4 Thomas Wright’s proposals for the north garden at Cleve Hill House, c.1750-55, based on his drawing in the “Lennox Boyd” Album (Victoria & Albert Museum No.E3990-1983). Comparison of Wright’s proposed layout with the garden recorded on the 1881 OS map shows that the main elements of his design – the large lawn in front of the house and the vista beyond with its flanking plantations and sinuous perimeter paths – were carried out more or less as he intended, with minor variations of detail, although it is doubtful whether the two arbours included in his proposals were actually constructed. In execution the garden was extended northwards beyond the rectangle drawn by Wright to meet the boundary with Cleve Hill Farm. A major addition at the northern apex of the garden, terminating Wright’s vista and probably designed by him as an afterthought, was an apsidal-ended orangery with a temple-like tetrastyle Roman Doric facade (St 6499 7740). This structure survives in good condition in the garden of “Yew Trees”, one of the large detached houses in the “Cleeve Lawns” estate built over the site of Cleve Hill House after its demolition in 1930. The boundary walls of the 1750’s garden have also been retained virtually intact to form the perimeter of the 1930’s estate. The eastern boundary is a particularly massive and impressive structure of pennant sandstone some 4m high and over 170m long. The northern section of this wall was provided with a system of heating channels, ventilated by two square chimneys and fired from two stoke-holes, to enable fruit trees to be grown along its eastern side, which is here faced in red brick. The western boundary, by contrast, consists of a sunken wall or ha-ha , allowing unbroken views downslope across the Frome Valley. To the east and north-east of the main garden further surviving stretches of mid-18th-century walling define former nursery and kitchen gardens now occupied by Oakdale Court and Cleeve Court. 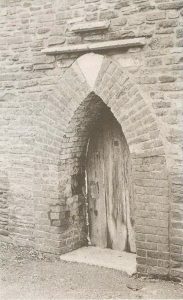 The walls are pierced in at least three places (ST 6498 7718, 6502 7733 & 6499 7739) by doorways with simple gothic arches (Plate 1). One further remarkable survival from the 1750’s garden remains to be described. This is a covered seat which originally faced on to the eastern perimeter path of the garden but is now situated to the rear of a house in Cleeve Lawns (ST 6499 7732). The seat’s existence was first noted some years ago by members of the Downend Local History Society; however, apart from one brief published reference (Harding & Lambert 1994, 39) it had received little further scholarly attention until October 2000, when by kind permission of the owner a detailed measured survey was undertaken by Laurie Bingle and the present writer, with the help of Ann Bingle and Ann Skelton (Fig.6). The seat is semi-octagonal in plan and measures 2.25m wide and just over 3m high. It is constructed of wood on a cement-rendered brick or stone base and is now roofed with zinc sheeting. It has an elegant west-facing pedimented facade with lattice-work panels, the distinctive design of which clearly relates it to the well-known pair of seats by William Kent, dating from around 1740, which flank the main vista at Rousham Park in Oxfordshire (Hussey 1967, 150, plate 219). The Cleve Hill seat is highly unlikely to have been the work of Kent himself, since he died in 1748, and while Thomas Wright may have had a hand in the design it does not appear on his plan for the garden. 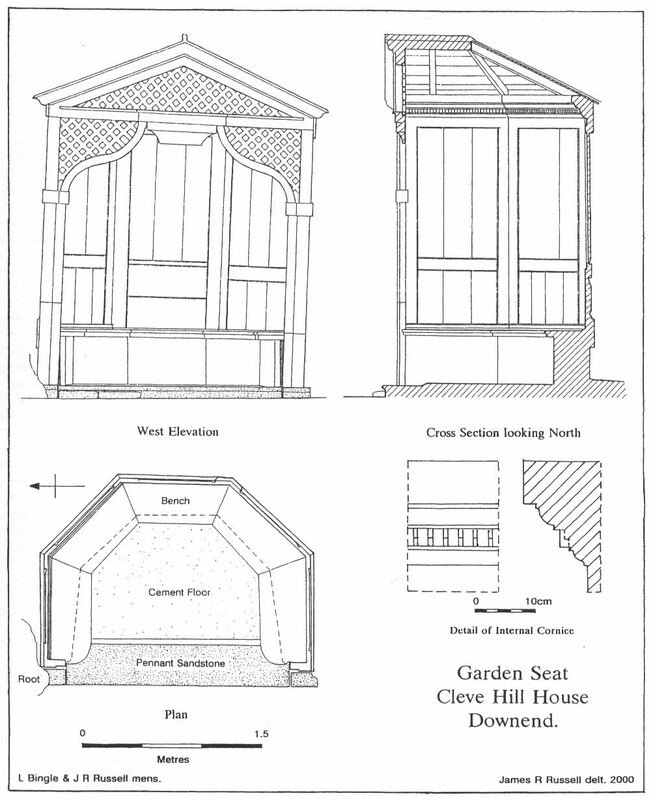 It seems more probable that Kent’s pattern for the facade was widely circulated among building tradesmen and was adapted for Cleve Hill by the carpenter who actually constructed the seat. It may be noted that the Stoke Park building accounts for February 1749 record that a “Mr Pitts” was paid £7 Os I Id for making a “Kent Seat’, presumably of this type (Gloucester Record Office D2700 Q/P 3/4/7). Plate 1 Mid 18th century arched doorway in boundary wall, Cleeve Court (NGR ST 6498 7718). Because of their relatively insubstantial construction very few wooden garden buildings have survived from the mid-18th century, at least in anything like their original condition. The Rousham seats, for example, seem to have been heavily restored, if not wholly rebuilt, during the present century. The Cleve Hill seat, however, appears despite a certain amount of patching and reinforcement to be still largely in its original state; it retains a number of refinements of detail, such as the internal modillion cornice and the bevelled or “fielded” edging of the external panels, which are absent from the Rousham examples. It is thus an exceptionally rare and precious survival. Although currently unlisted it is greatly appreciated by its present owner and is under no immediate threat in its secluded and well-tended garden setting. It has however developed, as the drawings show, a somewhat worrying 3 degree lean to the south, and it is hoped that conservation measures can be put in place in the near future. Fig.6 Measured drawings of mid 18th century garden seat. Thomas Wright’s involvement at Cleve Hill was probably limited to the north garden and its associated structures. It is tempting to see Wright s hand in two other surviving buildings in the vicinity – the former stable block and coach house, now converted to residential use and known as “Foxglades” (ST 6490 7711) and Lincombe Barn in Overndale Road (ST 6460 7698). Both have something of the flavour of Wright’s chunky “utilitarian gothic” estate buildings at Badminton, especially Lincombe Barn with its decoration of imitation arrowslits. The Barn however does not seem to have formed part of the Cleve Hill estate during the later 18th century, belonging instead to William Jefferies (Jones 1899, 160, 223) and both structures may be no more than somewhat eccentric examples of the local vernacular. 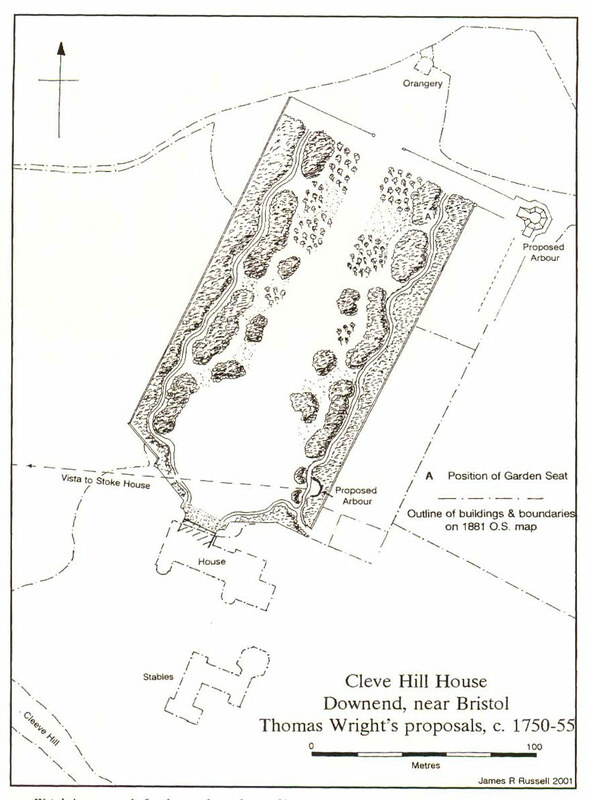 Fig.7 Map of Cleve Hill Estate c1881 (based on OS 6″ and 25″ maps). As noted above, Charles Bragge remains a somewhat shadowy figure. His later years seem to have been clouded by financial difficulties, the result of the collapse in 1768 of William Champion’s Warmley Brass Company, in which both he and Norborne Berkeley had been unwise enough to invest heavily; in July 1768 Bragge declared himself completely ruined by the consequence of my former infatuation (Day 1973, 93). These misfortunes may well have forced him to adopt a lower social and political profile than he would otherwise have wished. Nevertheless towards the end of his life, in 1787-8, Bragge was able to initiate a major change in the landscape of Downend and Cleve Hill by obtaining a private Act of Parliament for the enclosure of some 262 acres of “common and waste grounds” in Mangotsfield Parish, the last tattered remnants of Kingswood Chase (Jones 1899, 125-7). The present network of broad, straight roads between Downend and Staple Hill is largely the product of this act of enclosure. By 1790, however, Bragge was dead, and his son of the same name, (1754-1831), a rising politician, lost no time in putting his inheritance up for sale in lots, Cleve Hill itself being purchased by John Gordon (Jones 1899, 127-30). In 1804 the younger Charles Bragge inherited the extensive Lydney Park estates from his mother’s family, adopting the name of Bathurst in consequence. In the same year Cleve Hill was sold on by Gordon to Stephen Cave (1763-1838) a partner in the Bristol banking firm of Ames, Cave & Co (Cave 1899, 112-13, Jones 1899, 132). In his 1899 history of Mangotsfield the Rev A E Jones was at pains to stress the major role played by the wealthy Stephen Cave and his son Daniel (1789-1872) in the development of the Cleve Hill estate (Jones 1899, 133, 135). There can be little doubt that a number of features and buildings attributed by Stewart Harding in his 1989 article to Thomas Wright and Charles Bragge actually date from the Cave era some 70 years later. For much of the 19th century the Cave family continued the gradual expansion and consolidation of the estate within the framework of roads laid out by Charles Bragge in 1788 (Fig.7). New areas of parkland screened by plantations were created, while two smaller houses to the north-west – Cleevewood (ST 6448 7750) and the now demolished Cleve Dale (formerly Foysters Court; ST 6470 7738) – were purchased as subsidiary residences (Jones 1899, 142-4). Another significant acquisition, made by Stephen Cave in 1815, was a house and block of land to the south of Cleeve Hill; this had been occupied in the early- 18th century by a Mr Simmons (see Fig.1) and had then passed through a succession of owners, being used latterly as a lunatic asylum by Dr Edward Long Fox before he moved to Brislington in 1805 (Jones 1899, 133-5). Purchase of this strip of land enabled Stephen Cave to create a new approach to Cleve Hill House from the south, prefaced by the curious polygonal lodge on Downend Road (ST 6475 7652) referred to at the beginning of this article. In plan this consists of four octagons around a central chimney, the southern octagonal lobe being left partly open to form a porch (Plate 2). 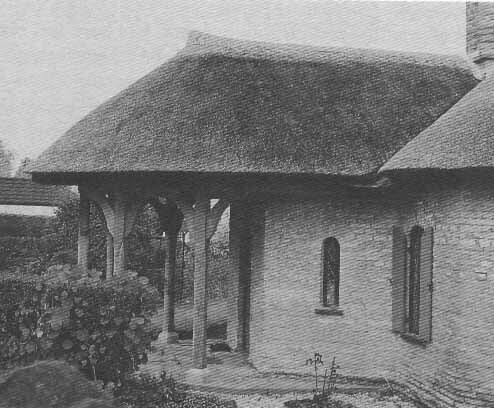 In recent months the present owner of the lodge has replaced its tiled roof with thatch, and installed a handsome timber arcade around the porch; while these “restorations” have undoubtedly greatly enhanced the appearance of the structure they are not, as far as the present writer is aware, supported by any pictorial or documentary evidence. Plate 2 South side of polygonal lodge at 86 Downend Road, probably built for Stephen Cave c.1815. The thatched roof and timber arcade round the porch have been introduced as part of recent “restoration”. 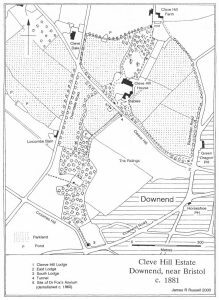 From the Downend Road Lodge Stephen Cave’s new drive, following the crest of the escarpment, passed northwards in a series of convoluted curves through an area which until 1788 had been an unenclosed corner of Kingswood Chase, extensively quarried for pennant sandstone. The undulations left by the quarrying, now partly masked by new plantations, would have created a ruggedly “picturesque” effect. It then traversed the eastern edge of the property purchased in 1815 before plunging in a tunnel beneath the Cleeve Hill roadway (filled in after 1920) to emerge close to the house. Here it was joined from the east by another new drive running through a belt of trees along the northern side of Cleeve Hill from a second lodge (now demolished) on the corner of Badminton Road (ST 6515 7687). A third lodge (ST 6485 7710) gave direct access to the house from Cleeve Hill; a 1938 photograph of this, taken shortly before its demolition (Downend LHS 1985, plate 35) shows a plain gabled structure enlivened by an elaborate polygonal chimney clearly inspired by John Nash’s Blaise Hamlet of 1810-12. Influence from the Blaise Castle estate is also discernable in the south carriage drive; in planning its serpentine layout, calculated to provide the susceptible visitor with a _frisson of pleasurable anticipation as well as an exaggerated impression of the scale of the estate, Stephen Cave seems to have learnt valuable lessons from Repton’s Coombe Hill drive at Blaise, laid out in 1798-99. On arriving at Cleve Hill House a visitor in the 1820’s would not have been disappointed. Brewer, writing in 1825, notes that “the good taste of a recent period has added greatly to the attractions and comfort of this elegant abode”; he praises the “correctness of judgement” with which the 10 acres of gardens and pleasure grounds had been laid out, and draws attention to “the hot houses and conservatories … on an extensive scale” and a “spacious aviary” (Brewer 1825, 169-70). Another amenity almost certainly added by Stephen Cave, though not specifically mentioned by Brewer, was the remarkable riding school attached to the stables south-east of the house (ST 6492 7713); octagonal without and circular within, some 12m in diameter, it had a conical roof structure supporting a central glazed lantern, clearly visible in the engraving by Storer (Fig.3) accompanying Brewer’s description (Jones 1980). In 1991 the structure was gutted and a small house with a courtyard garden was ingeniously inserted within its circular shell (Bristol Observer, 22 February 1991, 15). After his father s death in 1838 Daniel Cave made various somewhat ill-judged alterations to Cleve Hill House in an overblown early Victorian baroque idiom, adding a two-storey bay window to the centre of the north front, a projecting porch and window balustrades to the west (entrance) front and a ponderous clock tower to the south-east service wing (for photographs of the north and west facades after modification see Fisher (no date) plates 79-80). Along the south front a row of conservatories was constructed facing on to a flower garden with elaborate carpet bedding, depicted in a water colour of 1854 (Kingsley 1992, Figure 58). Shielding this garden from the carriage drive to the west was a pretentious sculptured screen wall punctuated by large urns. Towards the end of the 19th century the Cave family produced its own professional architect, Walter Frederick Cave (1863-1939); a pupil of A W Blomfield, he developed a varied and extensive practice centred on London and the Home Counties (Gray 1985, 137-8). He also produced a number of buildings for the family’s other estate at Sidbury Manor near Sidmouth in South Devon (Cherry & Pevsner 1989, 733-4). Around 1890 he designed a row of gabled cottages for Cleve Hill estate workers in an extremely attractive and accomplished Arts & Crafts manner strongly influenced by the work of Voysey; these are still to be seen on the east side of Badminton Road (ST 6522 7708). By now, however, the Caves, while maintaining their paternalistic role as de facto squires of Downend, were actually spending much of their time at Sidbury Manor. Cleve Hill ceased to be occupied by the family after 1905; in September 1920, following wartime use of the house as a hospital, the whole estate was sold and split into lots for redevelopment. Although, as we have seen, many features of interest have subsisted to the present day, the current multiple ownership of the area renders investigation difficult, and it seems likely that this “lost domain” has yet to reveal all its secrets. in Kingswood & South Gloucestershire, and for help and encouragement throughout. Thanks are also due to Ann Bingle and Ann Skelton for help with the survey of the 1750’s garden seat (and to the owner for allowing the work to be carried out), to Nicholas Deas for generously providing details of his valuable and painstaking research into the genealogy of the Player, Bragge and Bathurst families, to David Evans for making available extracts from the South Gloucestershire Sites & Monuments Record and to the Victoria & Albert Museum for supplying a photograph of Thomas Wright s garden plan. Atkyns, R, 1712 The Ancient & Present State of Gloucestershire. Brewer, J N, 1825 Delineations of Gloucestershire. Cave, C H, 1899 A History of Banking in Bristol. Cherry, B and Pevsner, N, 1989 The Buildings of England; Devon. Day, J, 1973 Bristol Brass: A History of the Industry. Downend Local History Society 1985 Mangotsfield Picture Past. Ellacombe, H T, 1881 History of the Parish of Bitton. Gray, A S, 1985 Edwardian Architecture; A Biographical Dictionary. Harding, S, 1989 The Wizard s Lodge Rediscovered. Avon Gardens Trust Newsletter 5 (Summer 1989) 14-16. Harding, S and Lambert, D, (ed) 1994 Parks & Gardens of Avon. Hussey, C, 1967 English Gardens & Landscapes 1700-1750. Ison, W, 1952 The Georgian Buildings of Bristol. Jones, A E, 1899 Our Parish; Mangotsfield. Jones, P, 1980 The Riding School on the Cave Estate, Downend. Kingsley, N, 1992 The Country Houses of Gloucestershire Vol 2 (1660-1830). Mowl, T, 1991 To Build a Second City; Architects & Craftsmen of Georgian Bristol. Smith, A H, 1961 Place Names of Gloucestershire (Vol 3).